Russia is one of the first countries where the iPhone goes on sale after the U.S.
Prices for latest model of Apple classic start at $895. Sales of the long-awaited iPhone 7 and iPhone 7 Plus smartphones officially start in Russia on Sept. 23. New Apple smartphones will be on sale in retail networks of Russian cellphone operators (MTS, Megafon and Vimpelcom) as well as networks of large Russian retailers of electronics and home appliances. Apple presented iPhone 7 smartphone in San Francisco on Sept.7. In the U.S., the new smartphone went on sale on Sept. 16. In Russia, according to the websites of mobile operators and retailers, iPhone 7 with a storage capacity of 32 GB worth in the region of 56-57,000 rubles ($895), with 128 GB - about 65,000 rubles ($1,020), with 256 GB - 74-75,000 rubles $1,177). iPhone 7 Plus with 32GB memory - about 68,000 rubles ($1,067), with 128 GB - about 77,000 rubles ($1,209), with 256 GB - 86-87,000 rubles ($1,366). Online stores in Russia start selling iPhone 7 at 0.00 a.m. local time on Sept. 23. Judging by the amount of pre-orders (it was announced a few days earlier), consumers are very interested in the new smartphones. "We see the growing interest among customers in the new products from Apple, in comparison with the last year," Julia Dorokhina, a representative with Megafon operator, told TASS. 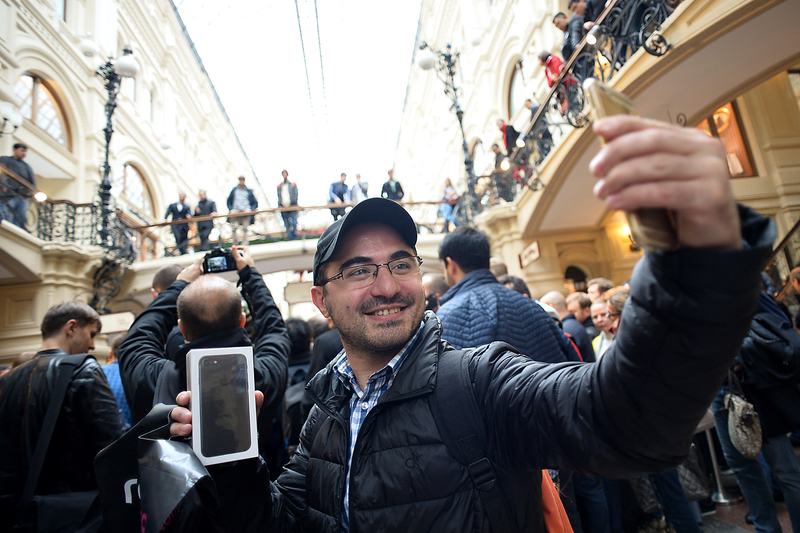 Megafon starts sales in the two big cities of Russia - Moscow and St. Petersburg. VimpelCom (brand Beeline) starts sales in 16 Russian cities at once: Moscow, St. Petersburg, Novosibirsk, Yekaterinburg, Nizhny Novgorod, Kazan, Chelyabinsk, Omsk, Samara, Rostov-on-Don, Volgograd, Ufa, Krasnoyarsk, Perm, Voronezh and Vladivostok. "We see that there is much more buzz than before", VimpelCom’s representative Anna Aybasheva told TASS. She attributes the popularity of the new model to such features as variety of colors and bigger memory. According to MTS to "early results suggest that the demand for the seventh model of Apple gadget is four times higher than during the iPhone 6s release." The operator starts the sales of new gadgets in almost all cities with the population of over one million people (Moscow, Voronezh, Rostov-on-Don, Perm, St. Petersburg, Chelyabinsk, Novosibirsk, Samara, Volgograd, Ufa, Kazan, Nizhny Novgorod, Yekaterinburg, Omsk). In addition, sales start in cities such as Krasnodar, Tambov, Stavropol, Orenburg, Khabarovsk, Novorossiysk, Novokuznetsk, Penza, Irkutsk, Vladivostok, Togliatti, Kaluga, Bryansk, Saratov, Perm, Barnaul, Izhevsk, Tver, Sochi, Krasnoyarsk, Yaroslavl. In total MTS starts sales in 35 cities.